This post would’ve probably been more helpful last week, as I imagine most of you are doing something fun (and are likely somewhere else) for Labor Day weekend, but since I left for Krakow last night, I guess it’s timely for me! I’m not sure about you, but I grew up with the Longchamp brand. Ever since I can remember, my mom has carried a Longchamp tote when she travels. This style actually may have been my first real handbag growing up! There are many features that make the nylon totes ideal travel companions: the tote is extremely light, the top zips up, the fabric is water resistant and it folds up completely flat for packing. While the nylon pieces are certainly the most recognizable, I’m really into Longchamp’s luxurious leather collection (specifically this classic tote and this burgundy crossbody for fall!!) right now. While shopping around with Katherine in London a few weeks back, we happened upon the Longchamp store on Bond Street and decided to pop in. I fell in love with the simple leather travel cases – I settled on the large cosmetic case you see above. Isn’t she a beauty? It’s the perfect size and fits all my travel skincare and beauty essentials. Plus, it was definitely time to retire my Jon Hart makeup case from college… Such a sophisticated upgrade, don’t you think? Since I’m only going to be in Krakow for three nights and am traveling alone, I’m packing very light. I plan to re-wear clothes by restyling them differently – for example, I will wear this dress walking around during the day, and then style it as a top with my favorite black skinny jeans for dinner! In addition to packing less clothes, I’m also carrying less product – as in beauty product. 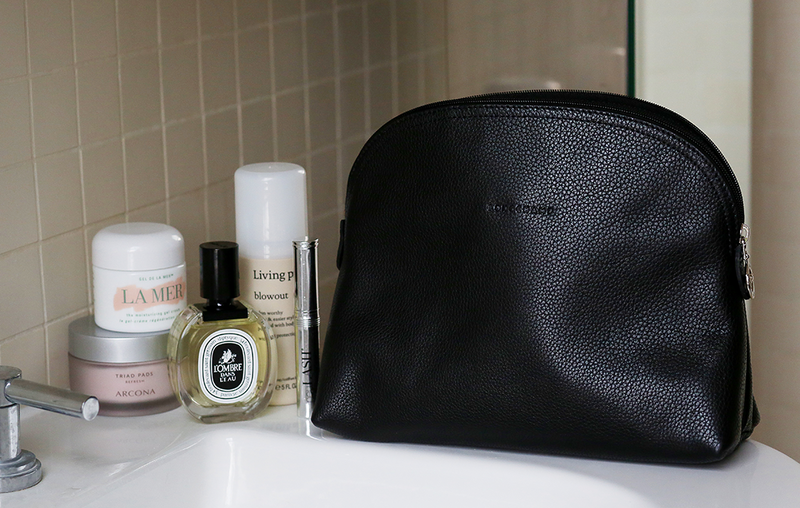 My Longchamp leather cosmetic case fits all of my beauty essentials: moisturizer, toner, NeuLASH (I use it every night! ), my new perfume, primer & tinted moisturizer, powder, bronzer, eyeliner and mascara. I’m keeping it super simple this trip – since I’m traveling solo, I don’t want to bring too much attention to myself, so I’ll be wearing very little makeup and pretty understated clothes the whole time. All of this fits into one small carry-on, so I’m good to go! 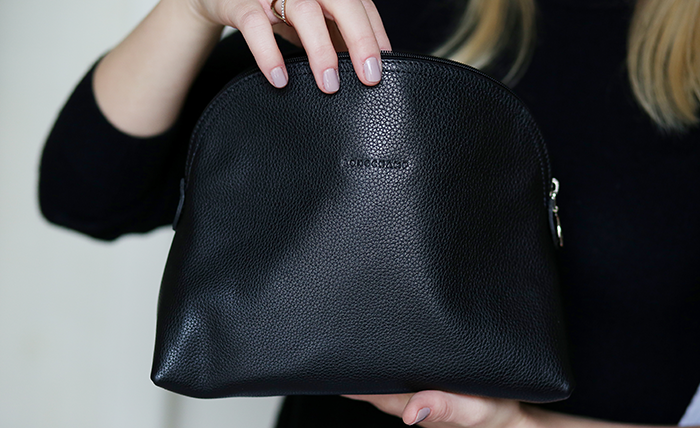 Be sure to check out Longchamp’s other wardrobe and travel essentials at Nordstrom before your next trip! Have a great time in Krakow!! Loving that make-up bag! Hope you’re having fun in Krakow! I adore Longchamp, it’s such a classic brand that will never go out of style! I’ve never tried that brand, but it sounds amazing! I always love these types of posts, no matter what weekend it is :) If you get a second, I would love to hear your thoughts on my latest. Same here, a longchamp tote was my first real handbag, and to this day my love for them is the same. They are the perfect thing to throw in your bag, they are so versatile!